Donald Trump is doing everything possible to increase the threat of oil drilling and spilling in the Gulf of Mexico and along all U.S. shores. He has issued an Executive Order trying to overturn efforts by President Obama to protect the Arctic and the Atlantic from offshore oil drilling. He's also moving forward with a proposal to open up 95 million acres of the Gulf of Mexico to new drilling. It's been seven years since we watched BP's Deepwater Horizon offshore drilling disaster threaten the Gulf coast and its communities. We saw a hundred dolphins and a humpback whale trapped and dying in oil. We watched the oil wash into the nation's most productive fishing grounds, and spoke with fisherfolk who didn't know how they would provide for their families. We also saw one of the largest oil companies on the planet screw up every step of the way as they tried to clean up and contain their pollution. 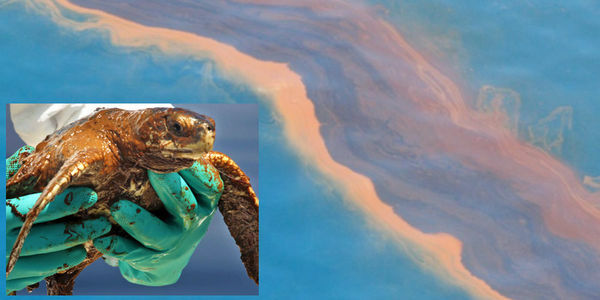 Sick workers, toxic and ineffective cleanup techniques, oiled turtles, seabirds and dead whales, government agencies incapable and unwilling to hold BP accountable to their own clean up plan. It was a disgrace. Offshore drilling is a dirty and dangerous business, and we should not allow it on any more of our sensitive coastlines. Oil and coal were great energy systems for the 16th and 19th centuries. Sign the petition and tell the Trump administration it's time for jobs-generating clean energy. We must leave offshore oil in the ground, under the seabed, and out of our precious bays and oceans. Read more about his oil drilling agenda here. Remind yourself how horribly the 2010 BP drilling disaster was handled here. ALERT: Trump is making history by offering 77 MILLION acres of the Gulf of Mexico for oil drilling (and spilling and exploding), even though earlier this month oil companies spilled ~700,000 gallons in a pipeline rupture, and a worker died in a platform explosion. STOP this dirty, dangerous, deadly oil agenda right now & share this petition to grow the resistance.